Whether alone or in a group, flowering dogwood (Cornus florida) never disappoints me with its sublime springtime floral display. In late March to April the showy white “flowers” appear before the leaves unfold. These gorgeous, 3- to 4-inch wide showy white petal-like bracts lure me like the Sirens from Greek mythology. (A botanist will gleefully inform you that the “flowers” of flowering dogwood are not actually flowers, but bracts, which are modified leaves that look like petals; the true yellowish-green flowers are clustered in the center of these bracts). These lovely floral bracts give rise to showy red berries in the fall. The fruit are complemented, if not upstaged, by the leaves that turn a stunning red to reddish-purple, which secures its place in the landscape as an essential spring and fall ornamental tree. However, I would ar gue that the horizontal branches and flat-topped crown of flowering dogwood provide year-round interest. te to pink to red “flowered” forms. 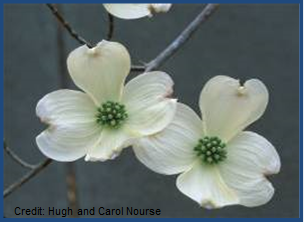 Although plagued by a few prominent insects and diseases (notably dogwood borer, dogwood canker anthracnose, and powdery mildew), there’s been a strong push at breeding disease-resistant dogwoods. Site flowering dogwood in the right location: partial shade (shade from afternoon sun) and the edge of woodlands. When growing in a relatively stress-free environment, this exceptional native American understory tree will captivate you year-round.